The OME-A-8111 is a 12-bit multifunction analog and digital I/O board for PC/AT compatible computers. The OME-A-8111 offers 8 analog input channels, plus one channel of analog output with 12-bit resolution. In addition, the OME-A-8111 has 16 digital inputs and 16 digital outputs. The OME-A-8111 provides gains of 1, 2, 4, 8, 16. It has a maximum sampling rate of 30 KS/s. 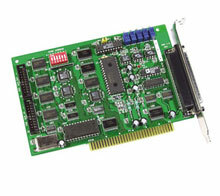 All boards are supplied with a standard software development kit for Windows 98/NT/2000/XP. The software development kit includes dll files for programming in C, C++ or other high level languages and OCX files for Visual Basic or Active X programming. LabView drivers are also included. Note: All boards include utility software and a complete user’s manual on CD-ROM.